In the middle of what seems like the longest heat wave in history, my 4 year old came down with a head cold. Last weekend I had noticed homemade egg noodles at the Phil’s Family Farm booth at the KGFM, so this weekend I stopped by Phil’s and picked up 2 8oz bags of the homemade narrow egg noodles. 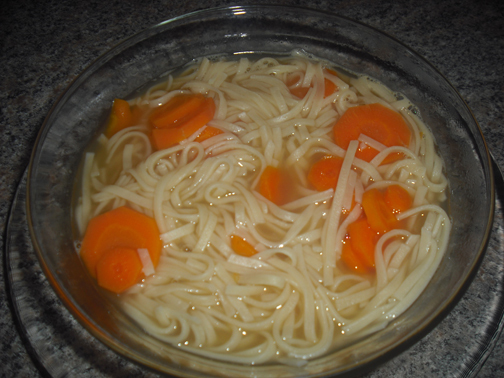 I have a family recipe for chicken noodle soup that calls for boiling a chicken until all that is left is tasteless muscle fiber and using the resulting broth for the soup base. I had also picked up a free range fryer from Phil’s, but it seemed like such a waste so I opted to use organic chicken broth instead. I use Pacific Natural Foods low sodium, but any broth you use should be fine. Bring broth and carrots to a boil then reduce heat to a simmer. Cook for 20-30 minutes or until carrots are cooked to desired tenderness. Add noodles and cook 7-10 minutes or until noodles are done. Salt and pepper to taste. Makes about 7 servings. This entry was posted in Farmers' Market, Local Farms, Recipe and tagged Chicken Broth, Chicken Noodle Soup, Free Range Fryer, Homemade Egg Noodles, Organic Carrots, Pacific Natural Foods, Phil's Family Farm. Bookmark the permalink.